The only individual time trial in this year’s Tour has character: 31 kilometers of steep climbs and very technical descents through Basque country. This is a stage for the overall contenders and should decide the final podium. 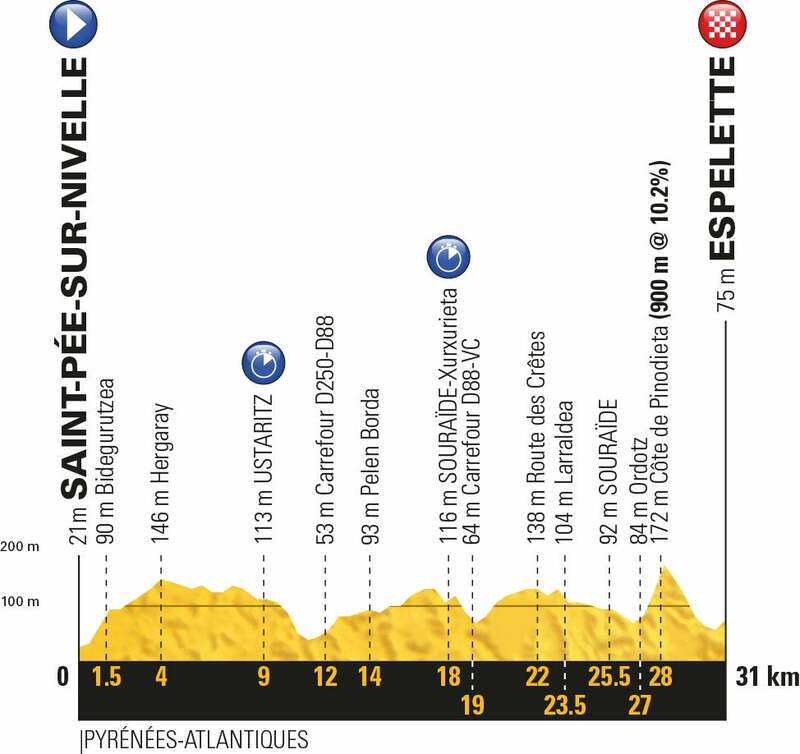 The gaps between the riders are expected to exceed a minute, underlining the difficulty of the stage, especially in comparison to the time trial last year in Marseille. Geraint Thomas (Sky) sealed his first Tour de France overall victory during stage 20’s individual time trial on Saturday. Dutchman Tom Dumoulin (Sunweb) won the stage by one-second over Chris Froome (Sky) and successfully defended his second place overall, while Froome moved into third place overall with his strong ride. Stage 19 winner, Primoz Roglic (LottoNL-Jumbo), who headed into the stage in third place overall, was pushed off the podium after finishing over a minute back. An emotional Thomas was at a loss for words as the gravity of his victory sunk in. At one point, Thomas had the fastest split on course, but when the Welshman nearly came to grief in a tricky corner, he eased up to ensure his victory. He ended up crossing the finish line 14-seconds down on Dumoulin. An ecstatic Dumoulin was in high spirits after winning his first stage of the 2018 Tour. The world champion admitted his team found out they lost his custom skinsuit earlier in the day, which required the team’s clothing sponsor, Exteondo, to quickly make a replacement. Despite seeing his podium evaporate out on course, Roglic was upbeat about his performance. Tomorrow’s stage sees the riders close out the 2018 Tour with a procession down the Champs-Élysées. While the stage traditionally finishes in the sprint, the lack of sprinters could see a breakaway steal the stage.